New York, Sep 18 (IANS) External Affairs Minister Sushma Swaraj kicked off her week of high-level diplomacy here on Monday with a trilateral meeting with US Secretary of State Rex Tillerson and Japanese Foreign Minister Taro Kono at which the three leaders called for respecting sovereignty and territorial integrity of nations. Meeting here on the sidelines of the week-long United Nations General Assembly meeting of world leaders, the three top diplomats discussed nuclear proliferation, maritime security and initiatives for cooperation among them, according to a statement from External Affairs Ministry spokesperson Raveesh Kumar. The three leaders “directed their senior officials to explore practical steps to enhance cooperation”, the statement said. The issue of ensuring territorial integrity of nations takes on added importance for India and Japan, both of which have faced aggressive actions by China. China disputes ownership of the Japanese islands of Senkaku and frequently Chinese military aircraft and ships intrude in to territorial waters around them. India and China were involved in a military standoff in the Doklam region of Bhutan in June after a Chinese road-building crew entered there with the military and Indian troops went in to stop them at Thimphu’s request. The three leaders also discussed North Korea’s recent nuclear and missile tests which is seen as a threat to global security. 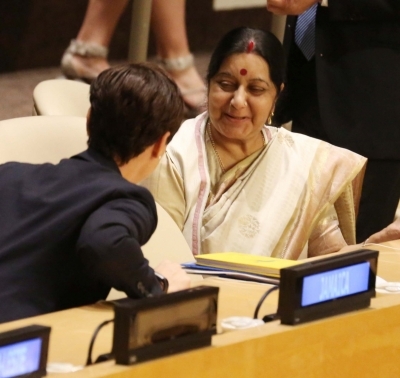 Sushma Swaraj “deplored” North Korea’s “recent actions and stated that its proliferation linkages must be explored and those involved be held accountable”, the statement said. Although the Minister did not name any country, the nuclear link between Pakistan and North Korea has long been established. The two countries had traded missile technology for nuclear know-how with Islamabad’s top atomic scientist Abdul Qadeer Khan playing a key role.